Why do Geologist Love Beer? Just in case you missed this article from Wired.com, a report from AGU on beer consumption. I am sure those of us who also attend GSA and/or SVP can relate. Thanks to Pete and Stephanie for the link! 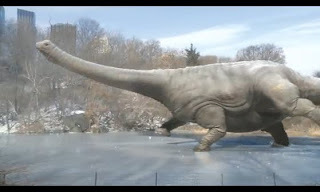 Check out this video of an ice skating sauropod via the Denver Museum of Nature and Science! Thanks to Jerry Harris for the heads up!! Are you still looking for the last minute Christmas gift for the paleontologist you love - or even something to suggest for yourself? Think Geek saves the day again with Evolvems! They have Coelacanth-Ichthyostega, Dimetrodon-Cynognathus, Pakicetus-Squalodon and my favorite Yinlong-Styracosaurus! How much fun would it be to open one of these on Christmas day and be able to unzip and flip the creatures inside out over and over and over again! I hope everyone has a very wonderful Christmas! The disaster that is the Dinosaur "Documentary" has struck again, this time in the form of Clash of the Dinosaurs. Last year it was Jurassic Fight Club, which there are very very very few good things that can be said for it. This years CotD, which premiered a few weeks ago (of which I have only see two episodes of), is not so impressive. Quite of bit of arm waving is once again presented as fact, and while a few good pieces of information made it though (Tom Holtz is wonderful as always, and his high energy and enthusiasm drips from the screen. Kudos Tom! ), over all it has been graphics that are obnoxiously repeated over and over, with talking heads who have poorly labeled affiliations and even misspelled names (so I am nit-picky, shoot me). Maybe I am a traditionalist, but I miss the former documentaries that showed more of the process, and paleontologist actually working, not just appearing as talking heads. I am all for science based learning and documentaries to help convey the ideas to a wider audience, but not at the cost of science for entertainment. "One of the curious things about Sauropods is that they did have a swelling in the spinal cord, in the neighborhood of their pelvis. This was sort of like a second brain to help control the back half of the body." "Ok one of the curious things about saurapods is that they did have a swelling in the spinal chord in the neighbourhood of their pelvis. And for a while it was thought that may be this was sort of like a second brain to help control the back half of the body. Erm there are a couple of misconceptions there. One is that most animals control large part of their body with their spinal chord. If you’re going through day to day operations like just walking down the street and your minds on something else your brain isn’t even involved in very much controlling your body. A lot of that is a reflex arc that’s controlled by your spinal chord. [From Matt] Quick aside: the technical term I was groping for here is not “reflex arc” but “central pattern generator”. So its not just dinosaurs that are controlling their body with their spinal chord its all animals. Now the other thing about this swelling at the base of the tail is we find the same thing in birds and its called the glycogen body. It’s a big swelling in the spinal chord that has glycogen which is this very energy rich compound that animals use to store energy. Problem is we don’t even know what birds are doing with their glycogen bodies. Er the function is mysterious – we don’t know if the glycogen is supporting their nervous system – if its there to be mobilised help dry [should be 'drive' -ed.] their hind limbs or the back half of their body and until we find out what birds are doing with theirs we have very little hope of knowing what dinosaurs were doing with their glycogen bodies." So basically they took his words, and completely misquote him and then do not apologize in follow up communication. "You, reading this post: you are the audience. If you disagree with the idea that Dangerous Ltd has to subvert the truth to hold your attention, or if you’d like to support my request that they fix the show by removing the dishonestly edited portion, please contact them here. I shouldn’t have to say it, but this is the net, so: if you do contact them about this, please be brief, stick to the facts, and don’t be abusive, threatening or profane. I’ve already e-mailed all of the top officers of Dangerous Ltd and this non-apology ... is the closest to an official response that I’ve gotten or expect to get. It might also be worthwhile to contact Zodiak Entertainment, the parent company of Dangerous Ltd, and make sure that they are aware of how their subsidiary is representing them. You may do so here; the previous plea for brevity and moderation applies. Finally, outfits like Dangerous Ltd will only be able to pull this kind of crap for as long as Discovery Communications lets them get away with it. The most relevant thing I’ve been able to find for them is the Viewer Relations contact page for Discovery.com, which is here. Please let them know how you feel–briefly and politely, as always." "The UBC Quarry in West Paterson, NJ has been a unique fossil locality for scientific research and spectacular fossils from the Passaic formation in the Early Jurassic period of NJ since the 1960's. Many discoveries over the years have yielded a great deal of knowledge to the scientific community in the area of trace fossils (ichnology) during this unique time period. Large museums and universities have done research projects and collected at the quarry to add to their collections and preserve these fossils. Ironically most of the fossils from this quarry are in private hands and not in a museum for folks to enjoy. The quarry was once an active quarry for many years but now has been sold to a developer to create high end condos that overlook NYC. The remaining fossils in the quarry will be forever lost if the developers are allowed to demolish the remaining section of the quarry to complete their development. No more fossils from this period will ever be able to be collected again as this is the only place in NJ that has fossils from this time period. Once this section is gone there will be no more science or fossils to be gained. There is one section of the quarry left next to Rifle Camp Park that is of scientific significance that is threatened to be lost forever due to the development of these condos. Some of the best preserved dinosaur and reptile footprints have been found in this quarry which do not compare to any other locality from New Jersey. Dinosaur tracks and fossil trace fossils have been a very unique, rare, and are an important piece of our fossil history and deserves to be protected. The state of New Jersey has done very little to protect fossil localities compared to other states in the USA and that is why we need your help. Trace fossils are a very important part of the state of New Jersey's history just like Hadrosaurus foulki and deserve to be protected, preserved and enjoyed by future generations. Let's not make this just a memory like other fossil sites in Northern NJ. Let's make it a preserved site forever. Time is running out and only a few months left till it is gone forever. Thanks." Thanks to Rissa for the heads up on this!